Un concepto convincente. La ecuación que Lenovo usa para describir su nuevo portátiles para juegos parece ser bastante lógica: potencia + portabilidad = perfección. La perfección puede no ser absoluta - pero Lenovo demuestra que saben bastante sobre buenos portátiles para juegos. If you’re looking out for a gaming laptop that offers powerful specs at an attractive price point, then Lenovo Yoga Y720 is a perfect choice. Just don’t forget to bring a decent pair of headphones and mouse along. In the end, the Lenovo Legion Y720 is a fine laptop, though it doesn’t really have much that makes it stand out from the crowd. As I said earlier, that isn’t necessarily a bad thing, because hardware – not software or design – is most important when it comes to gaming, and the stuff that’s packed inside this laptop is enough to ensure most games run well. Overall, if you’re looking for a gaming notebook and don’t mind the form factor, the Lenovo Legion Y720 is a relative bargain in the segment and is absolutely worthy of consideration. The Lenovo Legion Y720 is a good combination of high end 1080p gaming and good looks. It offers good overall performance, but is priced a little dearer than the rest of the competition. Lenovo's Legion Y720 is a great mix of power and portability. There are most definitely laptops with better specs on the market, such as the Y920 and devices with an Nvidia GTX 1080, but the lighter specs on the Y720 leave it a bit lighter and easier to carry around, without feeling like you're sacrificing anything. The Lenovo Legion Y720 is a solid machine, but it does have a few warts. The gaming laptop has a sturdy durable build, but it’s far heavier than most of its competitors, and the reflective shiny display lid mars the overall aesthetic. While the machine offers excellent audio, the dim and flat display detracts from your media viewing experience. 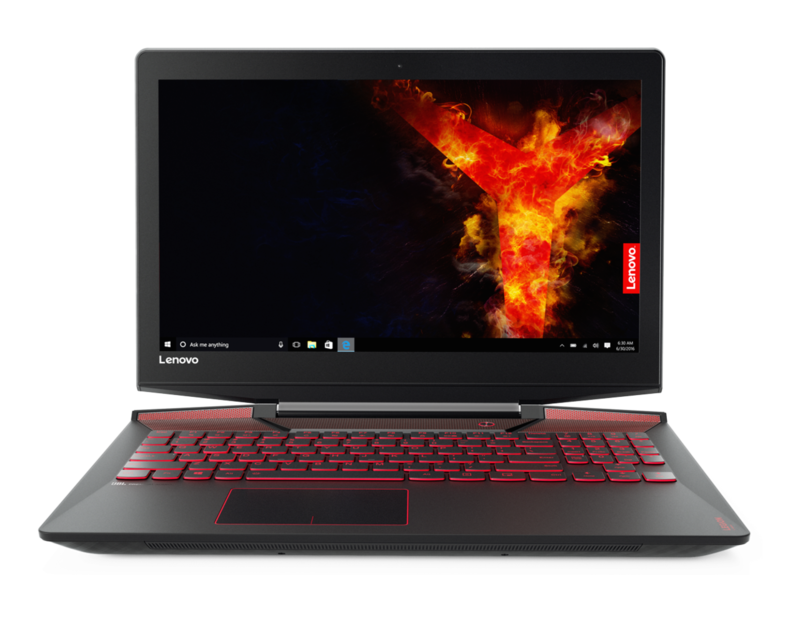 However, even with those issues, the Lenovo Legion Y720 is a solid offer. Armed with an Intel Core i7, Nvidia GeForce GTX 1060, and a 128GB PCIe SSD the Legion offers some competitive specs without breaking the bank. All in all, we think the Legion Y720 succeeds in its mission of offering a premium alternative to the Y520, particularly for gamers who value great sound or who happen to have an Xbox One controller they'd like to use. We don't see it breaking into Editors' Choice territory, however—it's a tad expensive considering its small SSD, and we almost wish Lenovo had given it a GeForce GTX 1070 for more performance or more separation between the siblings. It's an impressive rig, but not as impressive in its class as the Y520 is in its. We had some issue with our review unit of the Lenovo Legion Y720, so we still have some uncertainties regarding this computer's performance and temperatures under load. Most evidence point towards it working fine though (hence our overall rating), in which case this is one of the better 15-inch laptops with 1060 graphics out there. It's very well built, it gets a good keyboard and trackpad, a fairly large 60 Wh battery and excellent speakers. It also gets an IPS screen, albeit not with the best of panels. On the downside, it's heavy and bulky for the class, gets slow wireless and no SD card reader. Read on for the whole story below. Well, the Y720 gives some and then takes some. The low price, looks, connection ports are its plus and perhaps also the keyboard and speakers. On the other hand, you get lower quality IPS display with dull colors (but high contrast), no GSync and thermal handling that results in high CPU temperatures. The IPS quality means it won’t be suitable for some uses and also won’t look as nice for some people. The low price (bought for $1090 including tax) is rather good, but includes only 8GB RAM and 1TB 5400RPM HDD. Undoubtedly, if you were considering Lenovo for a gaming laptop this would be in the running. Understandably too, given the Kaby Lake i7-7700HQ and a GTX 1060 6GB. The specifications on offer here are those of a system which should be a shoe-in for capable 1080p gaming. It is. At the same time, it should, and does, eat up day-to-day application tasks with a quick and recommended NVMe SSD to maintain productivity. With both gaming and general use covered it’s thumbs up then. Further good news arrives with a solid design, ergonomics and speaker set up. The Lenovo Legion Y720 is a gaming laptop that's loud and proud. Its speakers are intensely powerful, and the computer boasts some cool innovations, like native support for all wireless Xbox One controllers. Legion ist mein Name, denn wir sind viele. 74.92%: Esta evaluación es mala. La mayoría de las portátiles son mejor evaluadas. Esta no es una recomendación para compra.